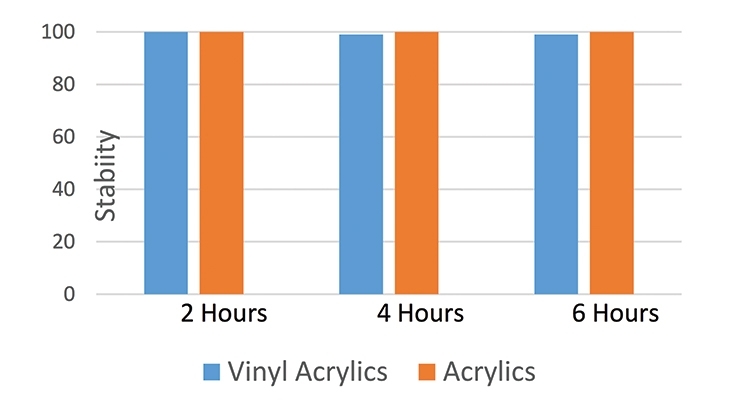 Figure 3: Vinyl acrylics and acrylics emulsions stability at ambient conditions after 2 hours, 4 hours and 6 hours. Figure 5: The pre-emulsion, in the syringe, stability and latex stability in reactor after overnight mixing. Figure 6: A particle size fractogram shows the particle’s evolution and growth with the addition of monomers at three separate intervals. 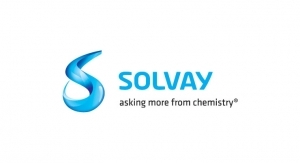 Surfactants are used in emulsion polymerization (EP) formulas at less than two percent of the total mass, but they play an important role in the EP processes. 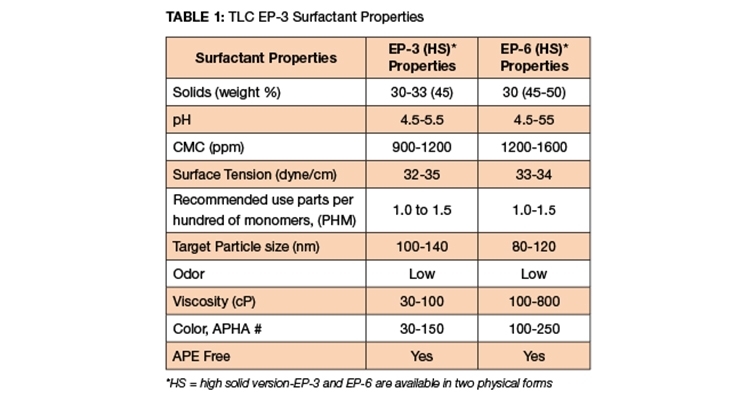 Surfactants contribute to the latex particle formation, their size and stability and they enhance the compatibility with the EP formula components, as well as ingredients used in product formulations, i.e., coatings, and pressure sensitive adhesives (PSAs). This paper presents novel, eco-friendly surfactants and their use in the EP process and discusses surfactant ionic activity and its effects on particle size and process cleanliness. Latex synthesized with surfactant optimal blends containing anionic and nonionic moieties are discussed; latex synthesized with optimal blend surfactant properties, and its coatability on paper, polyethylene terephthalate (PET), polypropylene (PP), polyethylene (PE), and polyvinyl chloride (PVC) films is presented. The emulsion polymerization process is commonly applied to synthesize nanospheres between 30 nm to 300 nm in diameter. 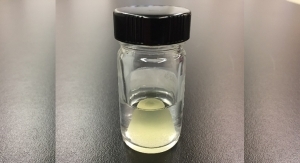 These nanospheres have been synthesized via seeded, in-situ seeded, and continuous processes.1,2 In the industry, there is ongoing interest to develop a surfactant to synthesize a high-solids latex of 65% or higher, and the need for these high solids latexes is cost driven - i.e., a shorter dry time in pressure sensitive adhesives. 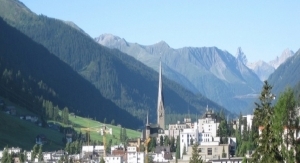 There is also notable progress in the synthesis of a latex with a particle size smaller than 80 nm and solids between 30-40%. 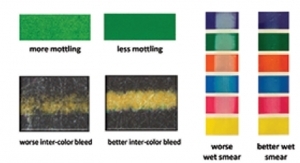 These small-particle-size latexes are application driven – i.e., the need for high gloss or fewer coalescent aids and good penetration at the substrate. 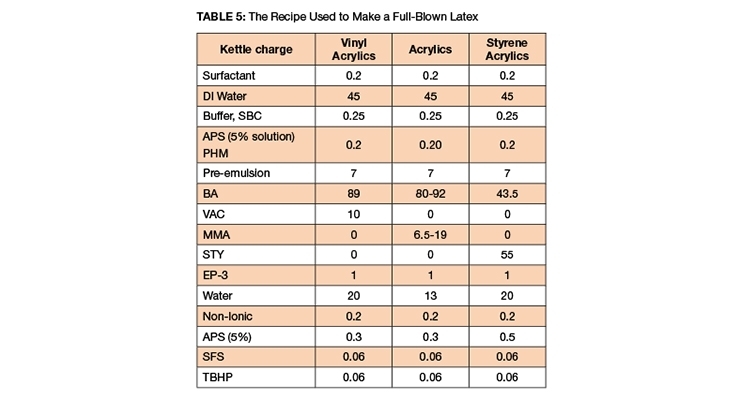 It is also required that a surfactant keeps a clean kettle which will lend itself to less downtime, ease of latex filtration, and low reactor build-up. The formation of grit and coagulum and reactor build-up begins due to various reasons and with various durations of the EP process, or due to poor stability of the latex, giving rise to flocculation and formation of aggregates and hard to clean reactors.3,4 To provide effective electrostatic and steric stabilization, novel surfactants were synthesized and evaluated in the emulsion polymerizations. EP-3, and EP-6 surfactants possess dual attributes, ionic and non-ionic moieties in the same molecule. EP-3 and EP-6 are highly functional acrylic latexes containing butyl acrylate (BA), methyl methacrylate (MMA), and glacial acrylic acid (GAA). Styrene acrylic latexes contain styrene (STY), BA and GAA. Vinyl acrylic latexes contain vinyl acetate (VA), BA and GAA. 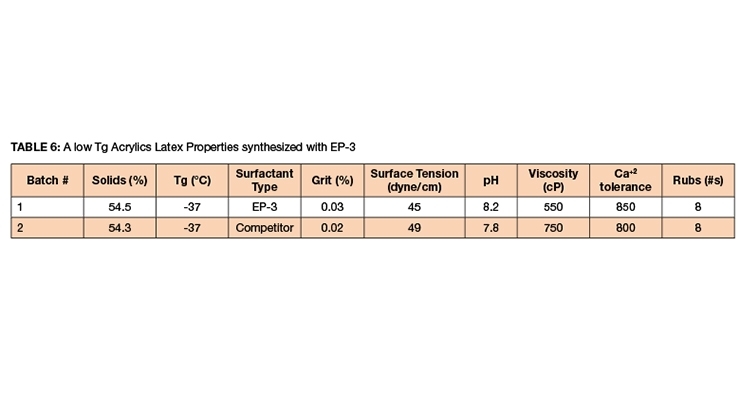 The physical attributes and properties of EP-3, and EP-6 are discussed in Table 1. 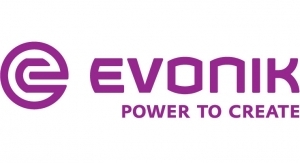 EP-3 is available at 30% solids and EP-3HS is available at 45% solids. The critical micelle concentration (CMC) is between 900-1200 ppm and its surfactant tension is 32-35 dyne/cm - low to mid-range. EP-3 is easy to pour, its APHA color is between 30-150, it has a low odor and is free from alkylphenol ethoxylate (APE). EP-6 is also available in two solid forms - low solids are 30 percent and high solid is 45-50%. The CMC is 1200-1600 ppm, its APHA color is 100-250 and has a viscosity of 100-800 cP and it is also APE-free. 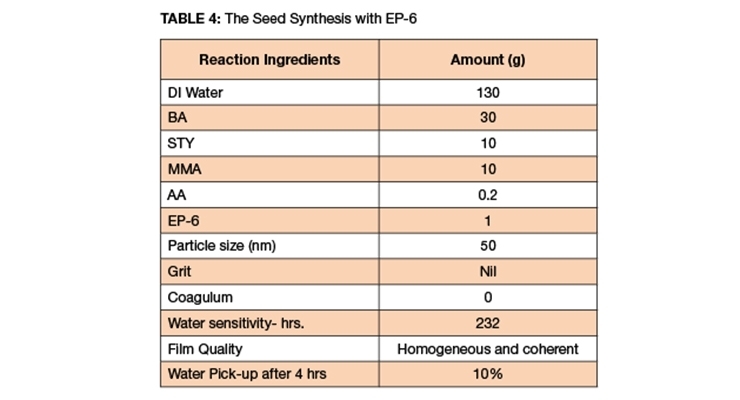 The seed formula used for the emulsion polymerization to demonstrate the efficiency of the EP-3 versus the competitor product can be seen in Table 2. 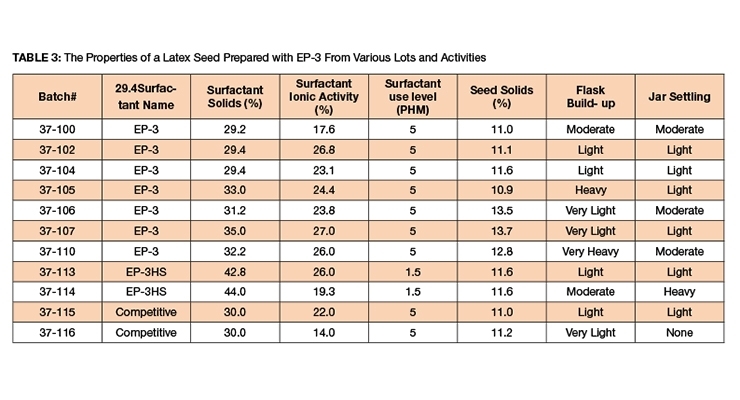 The target seed solids in these sets of experiments were 13.5%. DI water was purged with nitrogen and it was added to a glass reactor. Then, the surfactant was added to the reactor and mixed before the addition of the monomer mixture. At 65 °C, a thermal catalyst, ammonium persulfate (APS) was added to the reactor and reactants were mixed via a magnetic plate with adequate mixing maintained throughout the reaction. 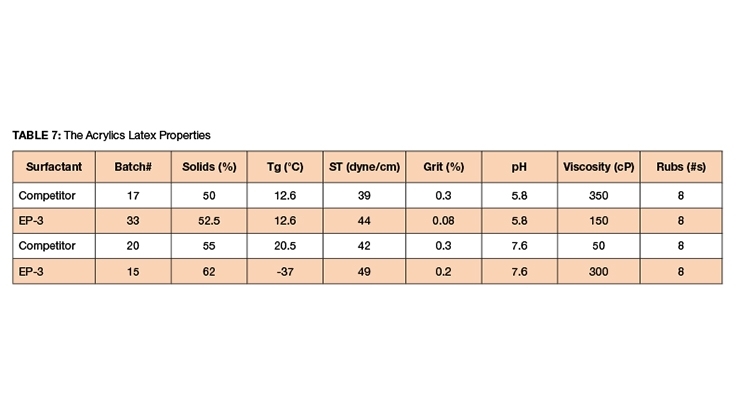 EP-3 and competitive samples were tested for their solids and ionic activity, as described in Table 3. Several batches of EP-3 were tested alongside competitive surfactants. The ionic activity of the surfactants varied between 14-27%. The surfactant was charged based on the surfactant solids. In the first set of experiments, the level of the surfactant was 5 PHM. In those sets of experiments, the build-up and grit data were low and the effect of ionic activity on reactor quality and build-up was not conclusive. In one of the high-solid surfactants with an ionic activity of 26% (batch # 37-113) we did not see any heavy build-up and we produced a good polymer. In the other high-solid surfactant with an ionic activity of 19.3% (batch # 37-114), there was heavier build-up on the vessel and the stir bar was covered with heavy settling after latex was being allowed to sit. When the ionic activity was higher, the reactor was cleaner with lower grit and settling levels. 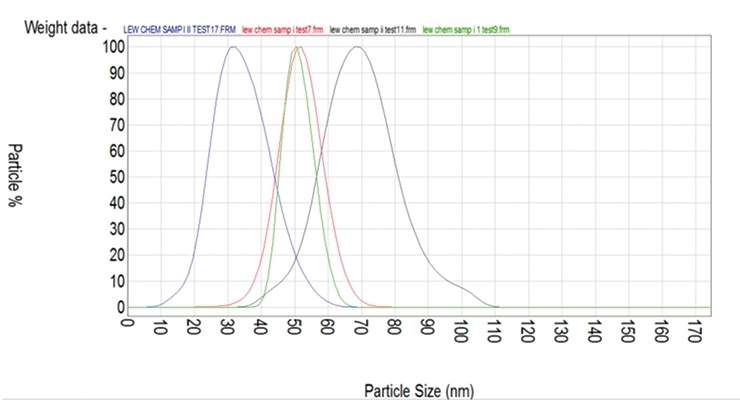 The particle size of emulsions made with various yields (% activity/% solids) was measured via a Malvern Zetasizer Nano ZS90 and the data is shown in Figure 1. 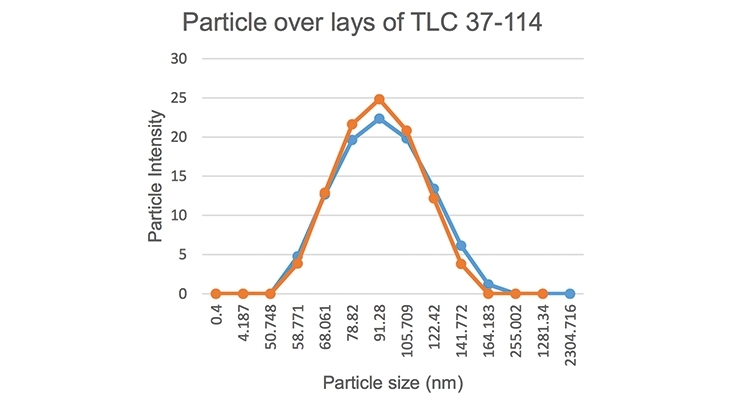 The particle size was narrow and two separate particle size analyses of the same sample showed good repeatability (Figure 2). 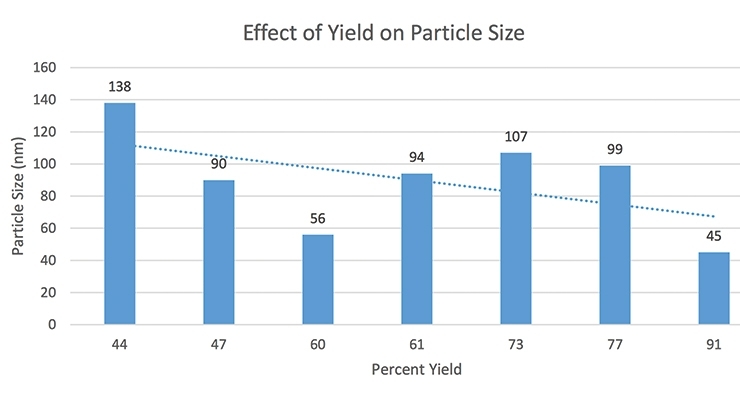 The percent yield and particle size have an inverse relationship; we have to conduct more studies in more monomer systems to fully confirm the relation between the yield and particle size and its influence on the reactor build-up. Two batches made with competitive products were measured and shown to have anionic activities of 14% and 22%. 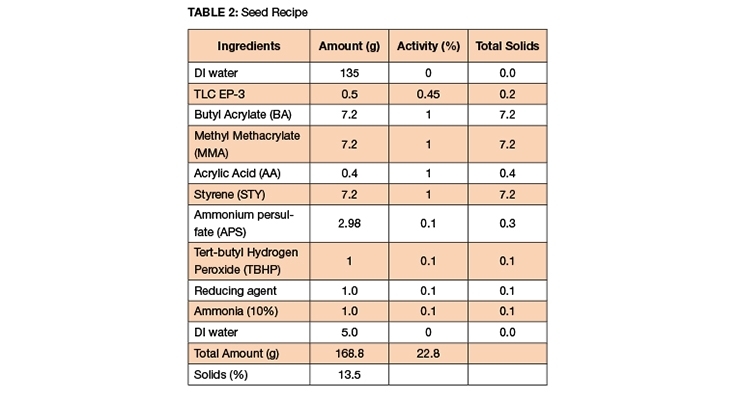 In those seed batches, when the level of the surfactant was 5 PHM, the impact of ionic activity (yield) on the reactor build-up was less obvious and data was inconclusive. However, when the surfactant concentration was 1.5 PHM, the activity influence on the reactor build-up was significant and was conclusive - higher ionic activity produced a cleaner reactor, lower grit, and lower build-up. 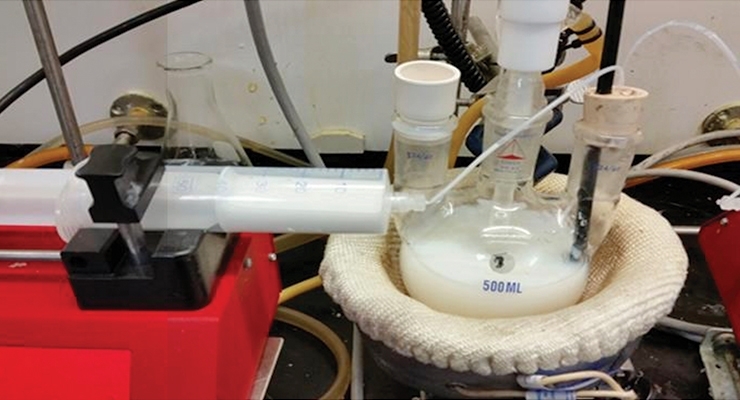 This data shows that ionic activity is crucial to producing consistent quality latex, and the EP formula should be prepared with the knowledge of surfactant activity. EP-6 was used to make BA/MMA/STY/AA seed. The solids were targeted at 30%, the reaction was ultraclean, and the particle size was narrow and 50 nm. There was no grit, coagulum or reactor build-up. The one-third monomer was added as a batch; the rest of the monomer was charged via syringe pump at 0.4 mL/min. The reactor was clean, the film quality was excellent, the particle size was 50 nm, and the water pick-up was 10% over four hours. The emulsion was made in a mixture of 30% water, 1.5 percent surfactant and 68-70% monomers. The surfactant solution was made by mixing the water with the surfactant, and then the monomer mixture was added to the Erlenmeyer flask at a constant stream of monomer droplets via an addition funnel. The solution was continuously mixed during emulsion production and then the emulsion, which was a milky thick solution, was staged at the bench at ambient temperature. The phase separation was monitored and data collected. 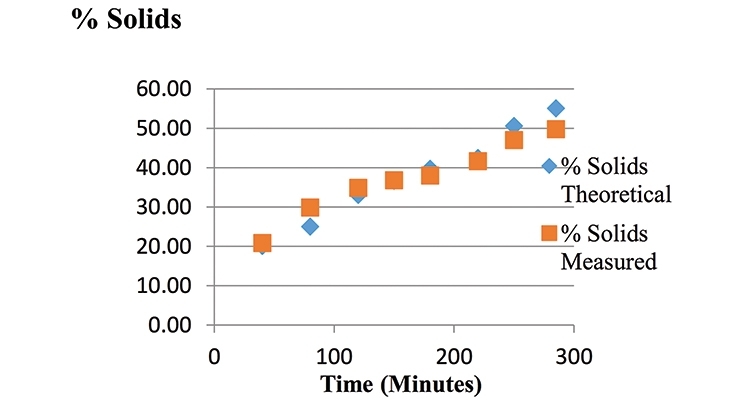 The emulsion proved to be stable over time between 2 h to 6 h as presented in Figure 3. EP-3 and competitive products were used to synthesize 60%, 62%, and 65% latexes via in-situ seeded emulsion polymerization. The formula is given in Table 5 and the latex data in Tables 6-7. In these sets of experiments, as shown in Table 5, nonionic surfactants of 0.2 PHM were used. The nonionic was added to improve the rub ability (latex was rubbed between two wooden tongs) of the latex; the latex was stable after 8 rubs. The reactor was clean between 52-56% solids. A pressure sensitive adhesive latex of Tg -37 °C was also synthesized; the reactor was clean, the latex offered good rub stability and solids were 62%. Latex samples were also collected at various intervals in the reaction, and solids were measured via a moisture analyzer; percent solids vs. time was plotted opposite to the theoretical solids. The measured solids were consistent with (or close to) the theoretical solids (Figure 4). EP-8 as a synergetic VOC- and APE-free surfactant. EP-8, an optimal blend, is a transparent, homogeneous mixture of anionic and non-ionic emulsifiers as described in Table 8. The anionic surfactants were selected to assist in the onset of nucleation and to stabilize the primary particles. 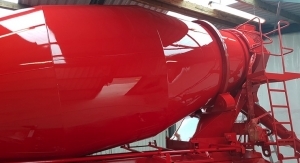 The non-ionic components were judiciously chosen to improve the latex mechanical stability. 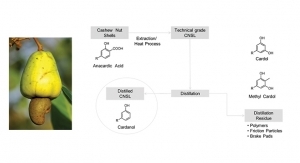 A couple of batches of latex were synthesized via an in-situ multi-step seeded emulsion polymerization process. 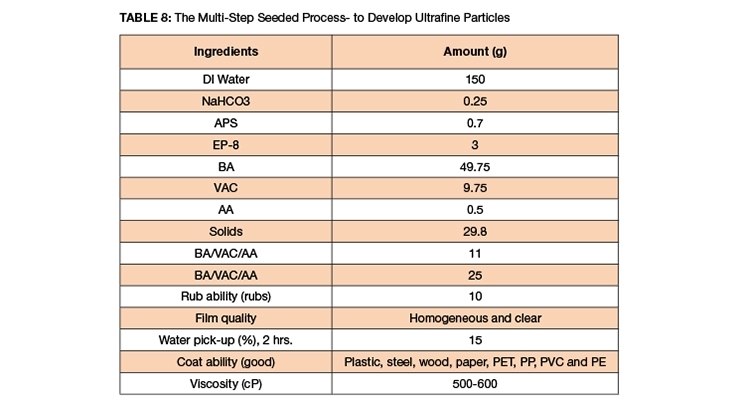 The EP-8 was used at 3 PHM to create ultrafine seed particles. When the reaction had reached 25% solids, the seed latex sample was collected and it was tested for particle size and latex rub stability. Then, more emulsion was added to the reactor to target 34-36% solids. Another sample was again collected and tested for particle size, solid measurement and rub stability. The third stage emulsion was charged at 0.44 ml/minutes to target solids of 44% or higher and sample was collected for particle size analysis. The emulsion was left in a syringe and the reaction was mixed overnight. The photo taken the next morning shows that the emulsion was stable for over 10-12 hours and the latex was also stable (Figure 5). At the end of each emulsion addition, the samples were collected and particle size was measured via CHDF from Mass Applied Sciences. The sizes of the particles was within the range of 30 to 80 nm (Figure 6). 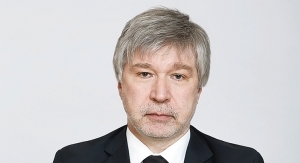 The polymerization was carried out under starved monomer conditions. This was extremely significant because those particles were smaller than any other latex synthesized under such conditions. Small particle sizes for this range of solids in emulsion polymerization have been made without any difficulty. The presence of anionic and non-ionic moieties in EP-3 and EP-6 are highly functional and those moieties assisted in generating ultrafine particles and the final latex was mechanically stable. The knowledge of anionic surfactant ionic activity is a preferable parameter to use in writing an EP formula that produces a latex with consistent quality. EP-8 is a highly efficient surfactant and, even when used as a sole emulsifier for the synthesis of a nanosphere latex, it produced a stable emulsion, a stable latex, a highly clean reactor and excellent coatability. The cast film was homogeneous and showed ample water resistance. The author wishes to acknowledge TLC management and the Berry College students that assisted in the research process. 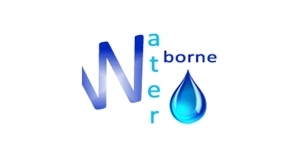 This paper was presented at the 2019 Waterborne Symposium. 1. Azhar Awan and Dave Vanzin, Experimental eco-friendly surfactants for the preparations of acrylics and vinyl acrylics latexes for architectural coating, 40th Waterborne Symposium, 2013. 2. Azhar Awan, Synthesis of nanosize latexes via emulsion polymerization, Technology Exchange Days at Cytec Industries, Stamford, 2012. 3. Pokorný, Zubov, Matuška, Lueth, Pauer, Moritz, and Kosek, Industrial & Engineering Chemistry Research, 2016 55 (2), pp 472–484. 4. The Effect of Surfactant Selection on Emulsion Polymer Properties, Ana Maria Fernandez and Loubna Jebbanema, August 1, 2007.